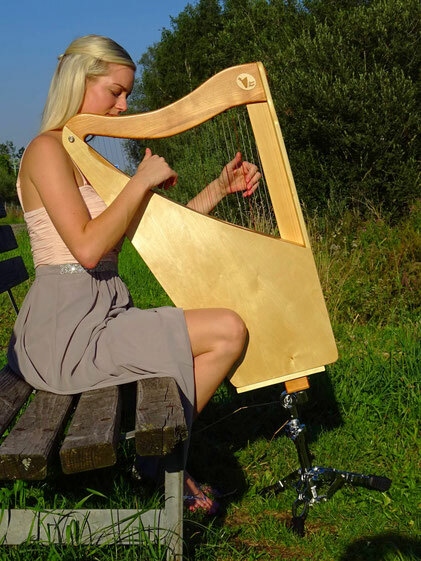 The travel harp Luna was developed with the aim to create a small harp with a large range. 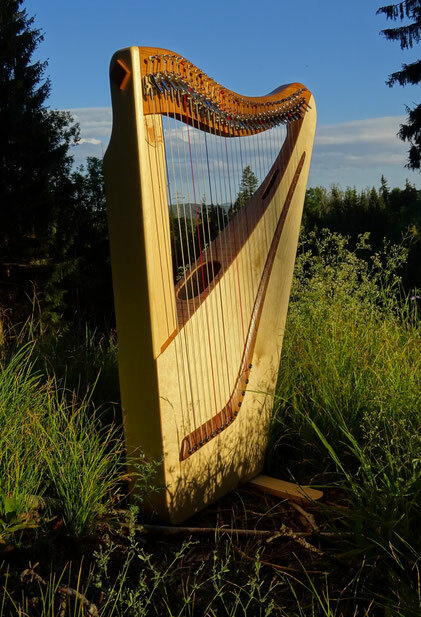 Usually the compromise to build a small, lightweight harp results in a relatively small gamut (mostly in a range of 25-28 strings) as well as a small sound box. 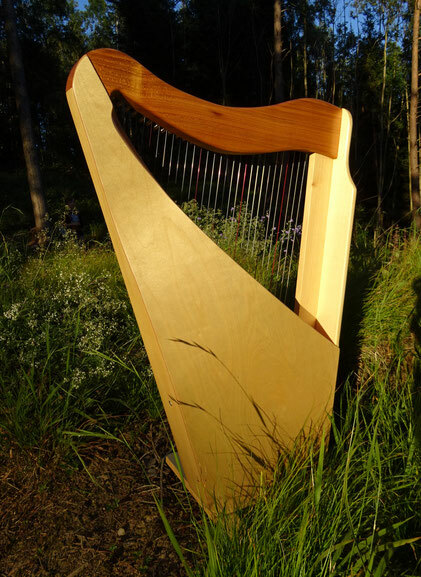 Thus the swinging soundboard and the cavity of the corpus are small and prevent a resonant, warm sound. The lateral attachment of the strings allows for 32 strings on a size of only approx 30/22/4 inch (78/55/10 cm). That´s smaller than a harpsicle. Previously built instruments of a similar construction had the disadvantage of a very small corpus strength throughout. With Luna the corpus widens at the bottom leading to an essential sound improvement. Thus the sound becomes warm, soft and full. 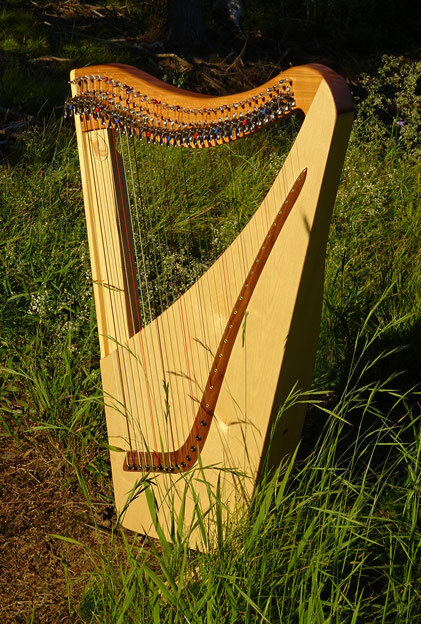 Strictly speaking and by definition Luna’s construction is not a harp but it has the same tuning (E flat major) and alignment of strings as a standard harp. 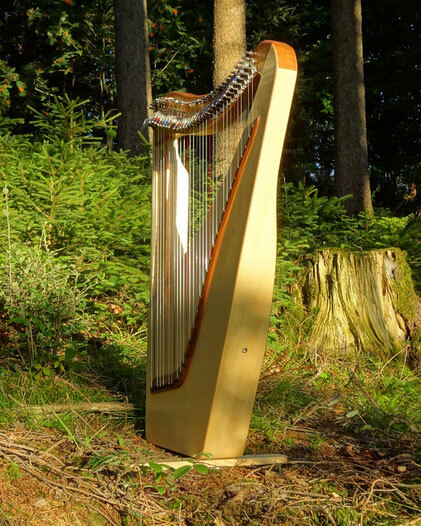 Because the string tension is rather small as customary with travel harps the Luna harp already responds to a light touch. With a weight of approx. 7,3 lb (3.3 kg) and stored in a backpack the Luna can be transported nearly as easily a guitar. 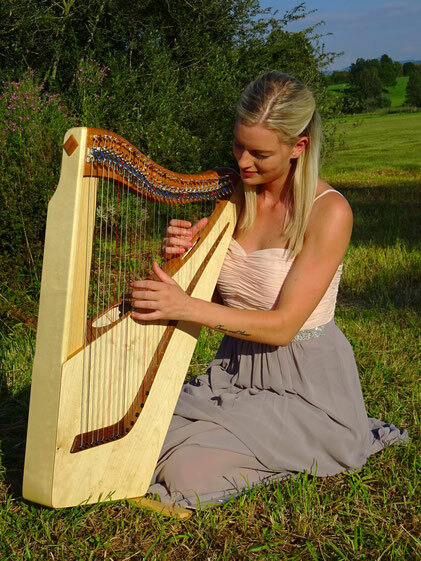 Travel harp Luna is completely produced in Germany. 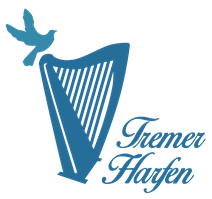 Please use the contact form to inquire about delivery charges to your country.